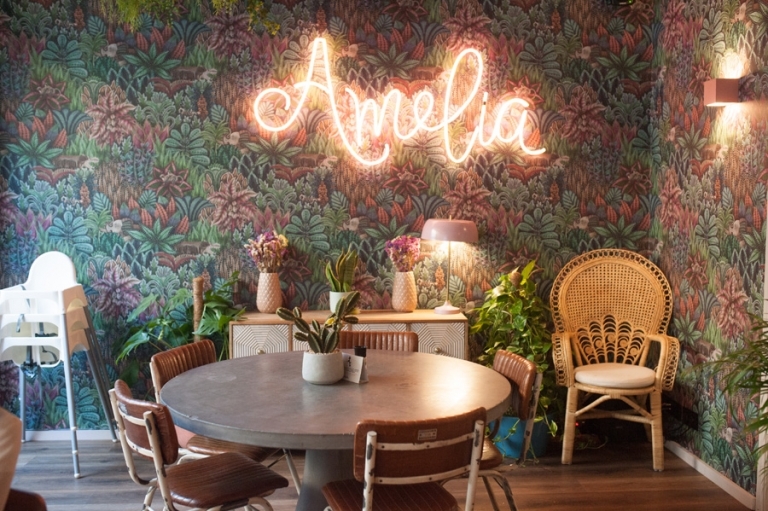 Day One: After arriving in Lisbon after an 8 hour redeye, we headed straight to this cute cafe Amelia. It may have been the cutest cafe I have ever been to! 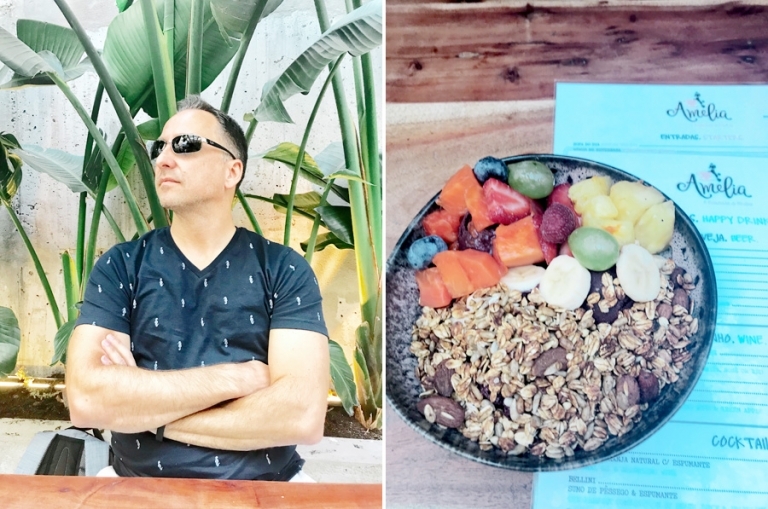 I had an Acai’ Bowl and I’m not sure what was in it, but let’s just say I barely made it to the restroom and I was sooo sick! Not a great start to our first day, but I felt better about an hour later. The rest of the day was spent exploring San Jorge Castle, and the Alfama district.. probably another of my favorites in Lisbon. I loved all the colorful tiled walls and doors around the town. Portugal is known for all the beautiful tile and you can see it everywhere. I was bummed we missed the tile museum that first day. It was on my list! We were pretty tired from being up so long and went back to the hotel and crashed around 8:00 p.m. not before enjoying our beautiful rooftop bar! We always ended the evening with drinks at our rooftop bar. Loved the Hotel H10 Duque De Loule in Lisbon! National Palace de Quelez- We started our day here and this one was my favorite! Loved the gold interior and gorgeous grounds. Pena Palace- Loved this colorful yellow and red castle! It was quite a hike to the top and in a flowy dress no less. I was pretty done after this.. but there was so much more to explore, so we kept on. Monserrate- Another favorite! Loved the ornateness of the castle, the inside and the beautiful column detail. Jeronimos Monastery- This was in Lisbon, and we only saw the outside but it was impressive! I could have easily spent a second day here just exploring all the castles. We made it to 4, but there was so much more I wanted to see and the cute little downtown was amazing! This easily was probably one of my favorite days in Portugal. A must see! This town makes you feel like you have been transported back in time. Looking back I would book a hotel here, it’s so pretty in the quaint downtown. We ended the day on the coast of Sintra at this amazing seafood restaraunt, Azenhas Do Mar with amazing views right on a cliff. Loved drinking wine and enjoying the views. The dinner was pricey but worth it. Such a prefect ending to amazing day we had. The colorful Pena Palace! One of my favorite.. it was like being in a fairytale and reminded me of my time living in Germany! Day three and four: The seaside town of Lagos. We drove about 4 hours to the coast of Portugal, Lagos, to spend a couple of days. We wanted to relax some and just enjoy the beach and beautiful scenery. The drive there was very barren, not much to see. I wasn’t sure what to expect! Once we arrived the town was super quaint, with white cobblestone streets and colorful shops. We loved our stay at Casa Mae! The grounds and pool were amazing. The food and drinks were locally sourced and they even grew their food in their own garden. We also enjoyed a couple days at the beach, walking around down and enjoying the local cuisine. Lots of wine too. Day 5: Caiscas, Portugal. This was the cutest little fishing town outside of Lisbon. I loved it as well! Lots of cute shops, right along the ocean. We walked, we browsed the shops, we explored the history of the town. Loved the beachy vibe! I loved getting lost through the cobblestone streets and seeing all the cute little alley ways, another town I could have spent more than one day. Day 6: Back to Lisbon. We headed back to Lisbon to spend one more night in a new spot downtown. Andy was a little nervous of the hotel I booked, he thought the area was a bit sketchy, I thought it was adorable! Look at the cute parrot wallpaper! We hard heard about pickpockets in Lisbon but not once did we experience this or feel unsafe in any way. I loved Lisbon and thought it was a beautiful country. I would love to go back one day. Be sure to put in on your list of European destinations! Oh and don’t forget to try the pastel de natas and port wine. So yummy!